Another installment in the iconic turn-based strategy game series. The players get to command a group of mercenaries tasked with eliminating a drug lord, who holds the tropical island in his iron grip. Jagged Alliance: Rage! is a turn-based strategy game, in which players have to retake a small tropical island from the hands of a ruthless drug lord. The game is a spin-off to the legendary Jagged Alliance series started back in 1996 and featuring many full-fledged and side installments. After bitComposer (the studio responsible for developing the series) had announced its bankruptcy in 2014, the rights were acquired by THQ Nordic (Nordic Games). The publisher ordered development of a new installment to the German Handy Games that previously worked mainly on games for mobile devices. The action of Jagged Alliance: Rage! is set twenty years after the events featured in the first installment of the series. Players are taken to a tropical island overrun by a ruthless drug lord and his men. Players are tasked with commanding a group of mercenaries and eliminating all enemy forces. Characters complete missions in extremely harsh conditions, without an external support and without proper means. Nonetheless, they have to overcome all encountered obstacles. In Jagged Alliance: Rage! players observe the action taking place on vast 3D maps from the top-down perspective. Turn-based combat allows one to choose a proper strategy and plan every move. The mercenaries controlled by players feature different experience level, skills and personality traits. Ivan Dolvich is the former Red Army major who specializes in an automatic weapon and assault tasks. Charlene Higgens is a SWAT operative and an irreplaceable sniper. Kyle Simmons is a stealth specialist who utilizes silent weapons and features incredible reflexes. During each mission, players have to balance their protégés' skills. Apart from regular opponents, one has to eliminate commanders who coordinate the actions of all the enemy forces. Apart from the single-player mode, the developers have also prepared an online cooperative mode for up to two players. 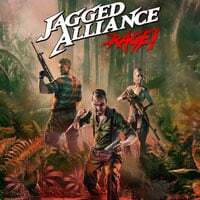 Unlike its predecessors, Jagged Alliance: Rage! features less realistic and more cartoonish visuals with highly contrasting colors.